Finally, woodworkers can enjoy adding bamboo to their woodworking projects with these solid boards of real bamboo plywood. Bamboo is lauded as a highly sustainable natural product that's durable and resilient, making it fantastic in many fine woodworking projects. Cutting boards, table tops, shelves, and picture frames are just some of the many uses for bamboo. Fast growing, bamboo is actually a tall grass not a tree. The grass shoots are processed into flat strips then laminated together to form the solid boards. 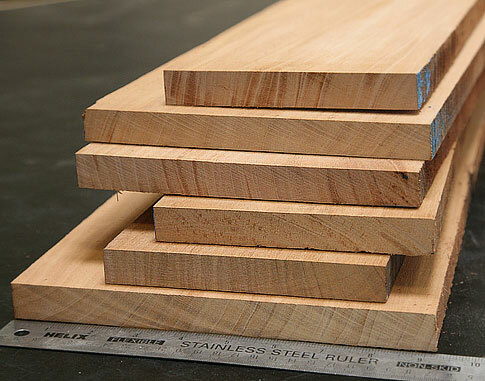 The material we stock here is known as 1-ply, a full 3/4'' thick and laminated into 12'' wide boards. 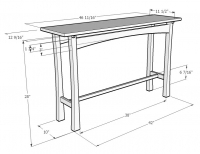 Now You Can Use Beautiful Bamboo in Woodworking! These solid boards of bamboo can be cut, routed, planed, sanded, stained and finished just like other hardwoods. And it's not just a good, durable and resilient material but also highly sustainable and offers a beautiful, unique appearance. Bamboo comes in uniform sizes 3/4" x 11-1/2" x 48" (actual) and is sold by the piece. Since the shoots are only a few inches in diameter, bamboo is cut and laminated into solid boards or sheets. 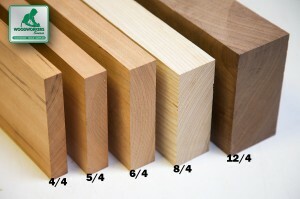 The wood is approximately as hard or harder than red oak. Natural bamboo that's formed into a wood product is pale yellow in color. Bamboo manufacturers also add color to the material to make product with different shade choices from darker brown to dark red. The fastest growing "tree" on earth, bamboo is actually a grass with wood characteristics. Grows in shoots up to 90 feet tall, but just a few inches in diameter. Harvesting bamboo does not require replanting. Regeneration occurs from the existing root structure which helps prevent soil erosion. we were looking for a durable wood with some grain running thru for an interesting look. we have two restuarants in our club so the Chef wants to create a serving board to send to the table with the side dish in a cast iron skillet (small) along with a butter or sauce dish for steaks. The wood was as it was supposed to be, great color and grain, and more importantly cost effective. This is the second time I've ordered these 1x12x48 boards from Woodworkers. This time I requested the 4 boards to be selected based on their overall tint or shade being as much alike as possible. I haven't used them yet but they definitely look essentially identical. I want to thank you and your Team for the recent order I received. The package was wrapped securely and no damage occurred during shipping. The wood is FANTASTIC. Product was beautiful and as shown on the website. Shipping took a really long time. The wood arrived in good shape with no damage. After completing my project (cutting board), I was surprised that the bamboo did not darken upon application of the cutting board oil. It stayed light tan when I expected darker carbonized. No big deal. It's good wood any how.